From the Meiji 30s, that is from about the beginning of the 20th century, wealthy people from the financial and political worlds began to take an interest in chanoyu. They were called modern sukisha (tea devotees). Sukisha did not insist on traditional chanoyu, but looking at chanoyu from the point of view of Japanese art, energetically collected famous chanoyu utensils (meibutsu) and created a luxurious and splendid chanoyu. A typical representative of this type of person is the founder of Mitsui, Masuda Takashi (Don'o). 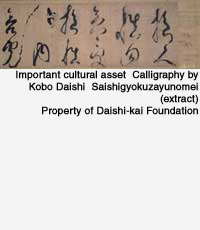 Masuda Don'o made a collection of a great number of art works that were designated national treasures or important cultural properties, and displayed these while inviting many people to chakai (large informal tea gatherings). This tea gathering is continued today as the Daishikai gathering. The collections of other tea devotees, including Nezu Kaichiro (Seizan), Kobayashi Ichizo (Itsuo) and Gotho Keita remain in the Nezu Institute of Fine Arts, the Itsuo Art Museum and the Gotho Museum. Tea devotees have succeeded in transforming chanoyu as a hobby into a modern form of education for the citizens of Japan.